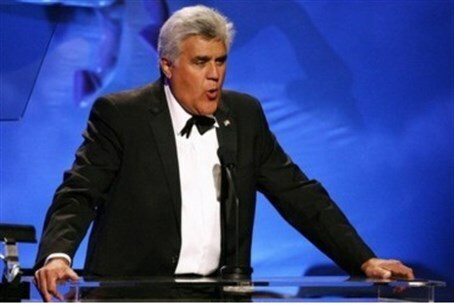 Iconic host Jay Leno not bothered by calls to boycott Israel, says "it's a great honor" to emcee the first Genesis Prize award ceremony. Iconic host Jay Leno, who is headed to Israel to emcee the first Genesis Prize award ceremony, said Friday he saw himself as “pro-Israel” and “pro-Jewish”, according to Fox News. Leno, for whom it will be his first trip to Israel, said he didn't have "any problem" with his decision to perform in Israel, despite growing calls on famous artists by many pro-Palestinian Arab activists to boycott the Jewish state. "It's a great honor. It's a great country. It's a great people," he said, adding that while he sees both sides of the Israeli-Arab conflict, he considers himself to be "very pro-Jewish, very pro-Israeli." Leno himself is not Jewish. "At some point in your life, you have to sort of take sides. I tend to side with the Jewish point of view on many things, especially issues like this one. I realize how important Israel is," said Leno, according to Fox News. Leno jokingly said that, given the recent collapse of U.S.-backed Mideast peace talks, it should make his job a little easier when he performs in front of Prime Minister Binyamin Netanyahu. "I guess any American that's not John Kerry is more than welcome there right now," Leno said. Leno said he will run his jokes by the "appropriate people" ahead of time to avoid saying anything inappropriate. He added said that Netanyahu and former New York Mayor Michael Bloomberg, the first recipient of the Genesis Prize, can expect to be the target of some of his jokes. "I think everybody around the world appreciates self-deprecating humor, and I think you can do jokes about the prime minister, and Michael Bloomberg getting the award certainly," he said, according to Fox News and added, "They're giving him $1 million. Wow. That's going to change his life." The Genesis Prize is a prize given to outstanding individuals who "embody the character of the Jewish people and values...and the State of Israel." The ceremony will be held on May 22 at the Jerusalem Theater, and will be attended by over 400 international dignitaries, including Nobel laureates, philanthropists and business leaders. It will feature world-renowned pianist Evgeny Kissin, who became an Israeli citizen last year.